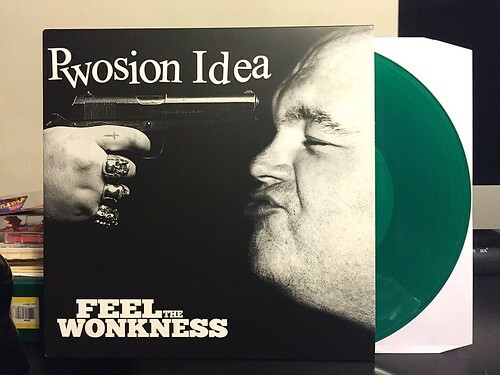 Before I say anything about Wonk Unit, an extra special thanks to the Drunken Sailor himself who sold me what I believe was the very last copy of this record on green vinyl after I dragged my feet on buying this one. I'd be kicking myself if I had missed out on the colored vinyl entirely as this is a hell of a record. Wonk Unit has been kicking around for a few years now. They've been on my radar for a bit, having put out a few CDs (this LP is actually made up of songs culled from these CDs). They were a band that I just never bought anything by for some reason. All the key selling points were there for me. Duncan Redmonds from Snuff drums for them at times, the main guy Alex was in a band called The Flying Medallions (I have a split 7" of theirs with China Drum) and lots of people whose taste in UK punk I respect have said great things about them. Maybe it's an aversion to CDs or maybe it's not wanting to pay those postage fees from the UK, but I can tell you I waited far to long to buy a record by Wonk Unit. While I did expect to like the Snuff style, catchy punk rock songs like "Guts" and "Lewisham," I was not prepared for how much I would like the songs that stray from that formula. There are several songs that are built off of completely different styles than tradition UK melodic punk. "Horses" is a slower, borderline plodding song with a simple kick/snare drum beat and incredible sounding string (cello maybe?) accompaniment. Then there's the primarily acoustic "You Married A Tortured Genius." You might get some weird looks buy saying this, but it's just a beautiful song with more strings and just the right amount of screaming. So it goes across the whole album. Killer song after killer song. It's one of those records that I cannot recommend highly enough. But now there's the question, does this qualify as a record you could put on an album of the year list? It's technically a compilation of previously released material, but I hadn't heard any of it before. So begins the debate.